Linguica. It’s part of the culinary fabric of California’s great Central Valley, available at every greasy spoon from Redding to Bakersfield, served at breakfast, lunch and dinner. You can thank the Azoreans for this one. I’ve heard tell that there are more Azoreans in California than there are in the Azores, which, if you are not familiar, are a small chain of islands off the coast of Portugal. You can see their names everywhere around here: Silva, Lopes, Mendes, Machado, Costa, Cardoza. Linguica eaters, all. What is this strange sausage of which I speak? Linguica (Ling-GWEE-zuh) is a pork sausage heavily spiced with paprika, chiles and garlic. 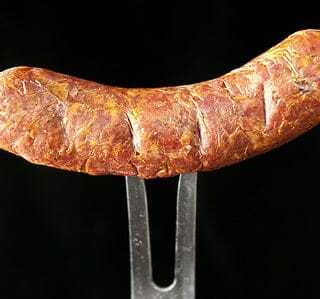 There are all sorts of variations, but linguica is normally a coarse, country sausage, and it is often smoked. I’ve eaten linguica all over the country, but the best have been in Gloucester, Massachusetts (where my mother and sister live), and here in the Valley. 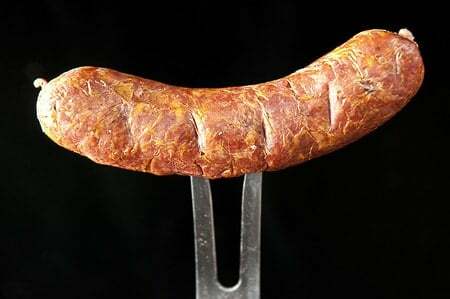 A really good linguica, to my mind, is a cudgel of a sausage. Smoky, garlicky and rich with pork fat and red peppers, it is spectacular served with grilled onions on a hoagie roll. A man’s sandwich. The Portuguese put linguica in almost everything, but in addition to sandwiches, I love it in soups with Portuguese cabbage (which is a lot like our collard greens) and potatoes. My friend David Leite has several good recipes using linguica in his cookbook The New Portuguese Table. I made my version with wild pig. Of course if you can’t get wild boar, you can use pork. But use good-quality pork from a good butcher or a farmer’s market. I suppose you could also use bear, too, if you have that lying around. 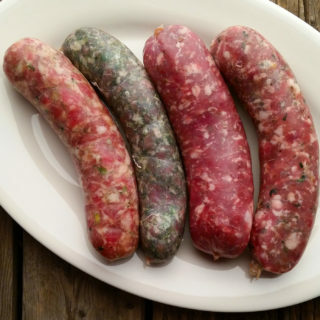 If you’ve never made sausage before, start by reading the sausage-making primer I wrote on my friend Elise’s site Simply Recipes. Portuguese linguica is a sausage open to variation, but it must have garlic, and almost always has both paprika and hot chiles. My version uses oregano and red wine, too. Whether you smoke your sausages is up to you. I like smoked sausages, even if they are only lightly smoked. If you cold-smoke your links below 90°F, you will want to use the Instacure No. 1 I call for in the recipe. It helps keep the sausage safe from evil bacteria. 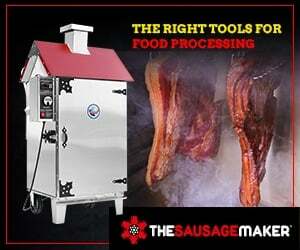 If you hot-smoke your sausage, or don't smoke them at all, you won't need the Instacure. Chill the meat and fat until they're almost frozen by putting it in the freezer for an hour or so. Take out some hog casings -- you'll need about 3 to 4 standard lengths, about 15 feet -- and set in a bowl of very warm water. Grind through your meat grinder using the coarse die, about 6.5 mm or so. If your room is warmer than 69°F, set the bowl for the ground meat into another bowl of ice to keep it cold. Put the mixture back in the freezer while you clean up. Add the wine to the meat mix, then mix thoroughly either using a Kitchenaid on low for 60-90 seconds or with your (very clean) hands. This is important to get the sausage to bind properly. Once it is mixed well, put it back in the fridge while you clean up again. Stuff the sausage into the casings. Do whole coils before making links. Twist off links by pinching the sausage down and twisting it, first in one direction, and then with the next link, the other direction. Or you could tie them off with butcher’s string. Hang the sausages in a cool place. If it is warm out or if you are smoking your links, hang for one hour. If you have a place where the temperature will not go higher than 38°F, you can hang them as long as overnight. If you are smoking your sausages, get your smoker going while the sausages hang. Smoke the links for at least 3 hours, and as many as 12. I prefer a lighter smoke, so you can still taste the pork and spices. I prefer oak, but hickory, maple, pecan or a fruit wood would also work. Once the sausages have dried and/or smoked, put them the fridge until needed. If you are freezing the sausages, wait a day before doing so. This will tighten up the sausages and help them keep their shape in the deep-freeze. These sausages will keep for about 5 days in the fridge, and, if well sealed, will keep in the freezer a year. You can find all sorts of recipes for fresh and smoked sausages right here on Hunter Angler Gardener Cook! I enjoyed this recipe and used javelina. Thanks, Hank! Sounds like a great recipe! Is there an approx. fat ratio you are looking for? I assume your wild hog is much more lean than anything at the local butcher. Joe: Yes, about 20 to 35 percent fat, depending on your preference. Is it a cold smoke? Andrew: It can be. I typically smoke cold-ish, at about 165F.